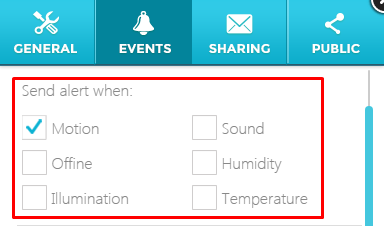 When you turn on Alert function in camera setting page, SpotCam will automatically detect both motion and audio event. The detection can’t be disabled once alert function is on, however you can decide whether or not to receive the notification in Send Alert When page. For example, if you only select the Motion Event in Send Alert When page, you will only receive the notification when motion event triggered. At the meantime, your SpotCam will still detect audio event, but you won’t receive any notification of audio event.